I grew up in New Jersey and moved to Boston for graduate school in 1999. Shortly thereafter, I began working as a scientist at a large biotechnology company and met my husband, Brian. We have two children, Colin (6) and Taryn (5). Colin was diagnosed with cystic fibrosis when he was 5 days old. Our first exposure to Team Boomer was when our friend Jen ran Run to Breathe in Colin’s honor in 2011. I remember thinking, “I really want to do that!” At the time I was just starting to find a groove as a working mom with an infant and toddler and knew that finding the time to start running and train for a 10K was not something I was ready to tackle. The next spring, my running journey started and I finished my first 5K in more than 10 years at a Turkey Trot while proudly wearing my Rock CF OutRun CF Shirt with “Running for Colin” written in neon green puffy paint. I then set my sights on Central Park. 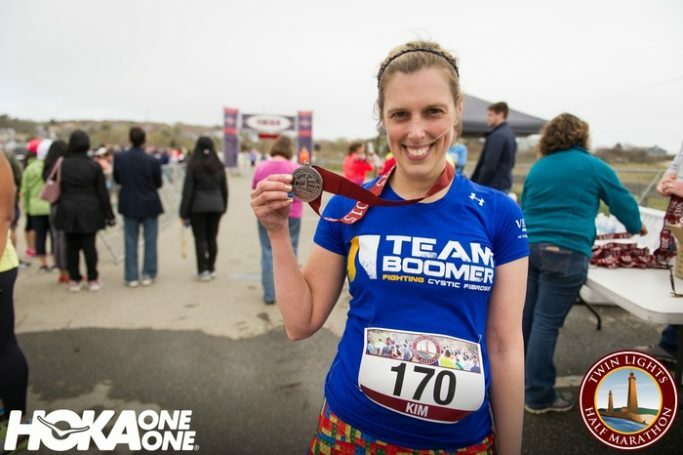 In July 2013, my friend Julie joined me for my first Team Boomer Event – Run to Breathe. It was in the middle of a heat wave and the air quality was horrible – so bad that NYRR considered cancelling the event. Instead of cancelling, it shortened the race and changed it to a fun run. I was so excited to run with Team Boomer in Central Park – I even scored a high five from Boomer! Disappointed to not be able to make the trip down for Run to Breathe in 2014, I remember getting an email with the reminder that any event could be a Team Boomer event. So I decided to run races locally raising awareness for cystic fibrosis and Team Boomer. In May 2015, I completed my first half marathon in Gloucester, MA and was so excited to hear “Go, Team Boomer!” as I was crossing the finish line! By the end of May we had raised more than $4000, and I was already brainstorming about how we could top that in 2016. This year, my Team Boomer campaign is Seven before 7. I plan to complete seven races before Colin turns 7 at the end of May. Starting on New Year’s Day with the Freezer 5, a five mile road race in Sterling, MA, the schedule also includes 3 half-marathons, a sprint triathlon and a two other local road-races. This month’s race is the Old Fashioned 10 Miler in Foxboro, MA, and I am very excited to run the New York City Half Marathon with Team Boomer on March 20. Colin is my biggest inspiration – his fight with CF gets me out of bed at 5 a.m. for training runs. I am also inspired by the parents of children with cystic fibrosis. In addition to unconditional love, they are master schedulers – squeezing hours of daily treatments into already packed school/sports schedules as well as medical advocates and fierce supporters. Personalize your story and message to engage your potential donors. Partner with others in both your network and community and plan a variety of events that appeal to a broad group of people. Growing up, I was a swimmer – and while I would run occasionally, I didn’t really enjoy it. It wasn’t until the spring of 2012 that I started to run regularly. I knew that running and cardio vascular exercise would be critical for my son and wanted to be a good role-model for both him and his sister. The more I ran, the more I needed to run. It has become an important time for me to balance stress and work through my thoughts and feelings regarding Colin’s CF diagnosis and the ups and downs that come with it. In addition to running for Team Boomer I also enjoy participating in virtual events like those hosted by Rock CF and running as a member of OutRun38, a virtual running group based in Connecticut. Both groups were founded by amazingly inspiring women with cystic fibrosis. Along with Team Boomer, these organizations lead a fantastic community of runners and athletes who embody the very best aspects of health and wellness while raising awareness for cystic fibrosis and supporting those who fight for tomorrows every day.